Do not like sunbathing all day? Want to have some fun and get a dose of adrenaline and remember the vacation! Here is a list of the most interesting entertainments in Bali! Surely, the most famous entertainment in Bali is surfing. Bali is a surfing Mecca for surfers of all levels! Excellent weather conditions all year round, warm water and lots of surf schools. You can't come to Bali and not try surfing! You can attend to one of surf schools and take 1-3 lessons to understand what it's like:) and if you understand that it is your dream – continue your training. Most surf schools are in Kuta. Choose the best surf school with MyBaliTrips! Paragliding and powered parachute over the island and the ocean is a unique entertainment! What can be cooler than having a flight? Paraglider now is probably the safest kind of flight, as paraglider's design is very strong , every detail is done in the way to exclude even the slightest possibility of a malfunction. And since it is handled by an experienced pilot, he will take care of everything, so you only enjoy the breathtaking views. The ascent to the active volcano is also a very unique entertainment. You cannot try it in kinda Thailand. Meet the dawn and wake up early in the morning at the top of the most famous mountain of Bali – Batur volcano. Admire the breathtaking views from the height near Kintamani village and learn interesting facts about the history of the region from local guides. Meeting the dawn at the top of the volcano is an extraordinary feeling! Join us. 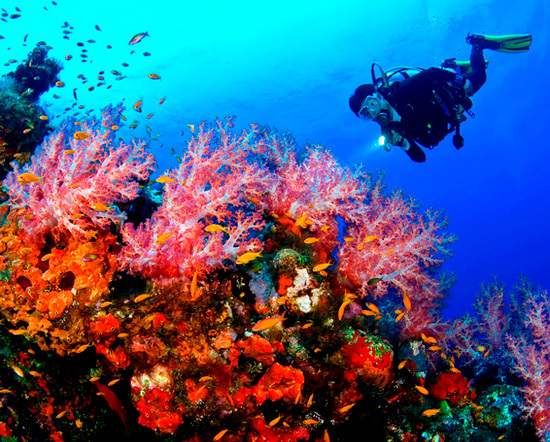 Explore the underwater world of Bali, dive to see the exciting coral walls. If you have never dived, then it's high time to try diving in Bali! Anyone can dive, even a person without training. Certified instructors will give detailed instructions and will be next to during the dive. The underwater world of Bali is very beautiful! The best diving places are located in the East of Bali in Tulamben, on Nusa Penida Islands and Lembongan and Menjangan. All inclusive rafting tour with transfer and delicious Balinese lunch. You can choose a simple route and take children or more difficult and put yourself to the test and get adrenaline. The incomparable beauty of mountain rivers, hanging vines, picturesque rocky gorges with water splashes, fun and breathtaking river rapids will not leave indifferent megacities lovers and as well as fans of outdoor recreation . A team of professional instructors of raft clubs will make your adventure safe and entertaining. 6. See the active volcano on the neighboring Java island! Do you want to see with your own eyes terrific landscapes not found anywhere else in the world? Then visit Ijen and Bromo volcanoes on the neighboring Java island! One of the most famous and visited natural attractions in Indonesia is the Ijen volcano, located on same-name Ijen plateau on the Eastern edge of Java island. Tourists come here at night to see the fascinating blue flame of burning sulfur, the world's largest acid lake and to meet the dawn on the crest of the crater. Another exciting thing to see is sulphur miners' work. Be sure to visit Ijen, as the trip takes only 1 day, that will stick to your memory. If you are not ready for scuba diving, definitely try snorkeling. 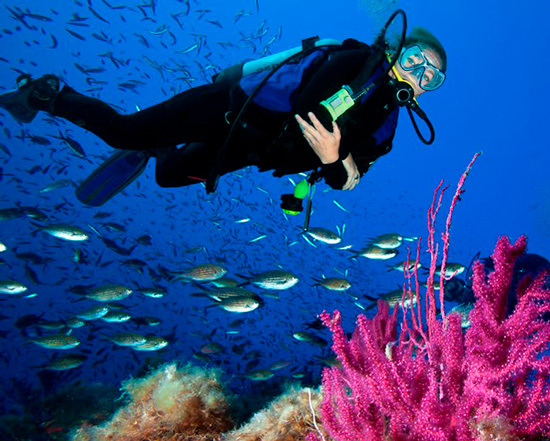 It is an easy and inexpensive way to enjoy the beauty of the underwater world without any risk. You'll only need a snorkel mask and maybe a lycra or t-shirt to protect yourself from the sun. It is an unforgettable feeling to swim with manta rays, giant and absolutely harmless rays. Good places for snorkeling are located in the East of Bali. Trust the professionals and go with us on a underwater journey. 8. Through the jungle on an ATV! Have you ever ridden an ATV? 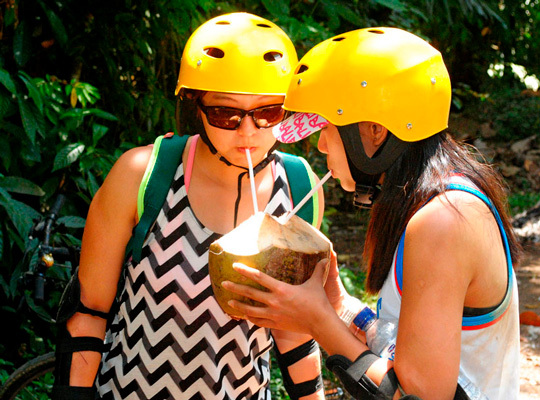 A trip through the dense jungle and impassable routes on an ATV will impress everyone! Adrenaline, speed and powerful vehicle - an indescribably cool feeling! It is not just an activity, but an informative, exciting and a little extreme trip both for big companies and intimates. Extremity degree can be chosen. Perfect type of vacation for those who do not want to get bored in the hotel. - Learn about prices, conditions and book an adventure on MyBaliTrips right now. There are several companies that organize bike rides on bike lanes in the jungle and rice terraces in Bali. Cycling is a healthy way of spending your vacation perfect for adults and children! The route runs through traditional Balinese villages, rice terraces, tropical jungles on asphalt and over rough ground. Adventure for the whole family! 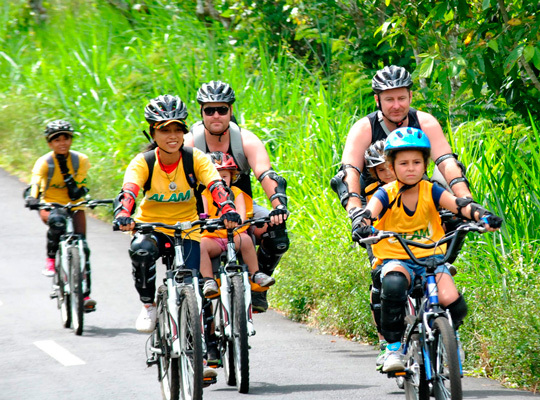 You can book here ➥ Cycling tour in the heart of Bali. For those who know how to drive a motorcycle and understand what true freedom is we offer to race on professional tracks on a crossover bike. It does not matter whether you're a guy or a girl, the feeling of motocross riding inexpressibly cool. Do not be afraid, even if you are not experienced, professional instructors will tell you how to handle this light and fast motocross and after the briefing you will be able to practice your skills. Riding cross bikes in Bali on the volcano, jungle and black beach is an unforgettable adventure! Discover another world of Bali full of excitement and extreme!